The MediaMill semantic video search engine is bridging the gap between research and applications. 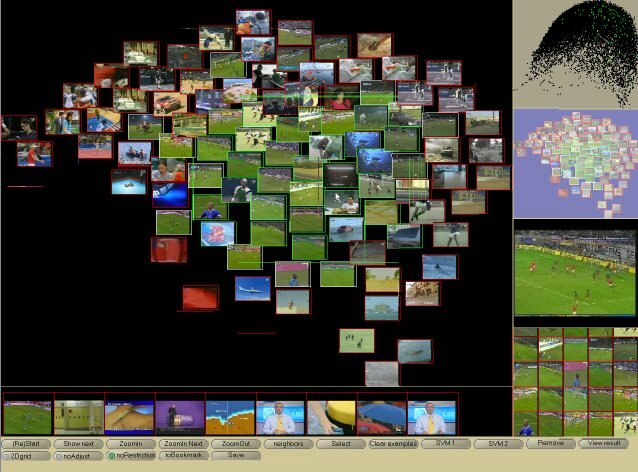 It integrates the state-of-the-art techniques developed at the Intelligent Systems Lab Amsterdam of the University of Amsterdam and applies it to realistic problems in video indexing. The techniques employed in MediaMill originate from various disciplines such as image and video processing, computer vision, language technology, machine learning and information visualization. To ensure state-of-the-art competitiveness, MediaMill participates in the yearly TRECVID benchmark. Some facets are hierarchically structured, others are flat lists of terms. Some facets in the thesaurus are updated regularly, others are more stable over time. A relational database is used for storage. The GTAA plays a central role in research and software development within the CHOICE-project. As a pilot project for the CHOICE research program a web application for browsing and searching for relevant terms in the GTAA was built. The user interface was designed to exploit all structure and information present in the thesaurus, or added by CHOICE, in a useful and user friendly manner. Examples are: are broader/narrower term hierarchies, thematic classification of terms, associative relations between terms and cross-facet links. When searching for terms, the use of synonyms and spelling variations provide with additional entry points for searches. In the MuNCH project MediaMill aims to deliver a working video retrieval system to the Sound and Vision national (video)archive. A first version is planned for at the end of 2006 making use of the engines for video analysis and interaction. In the MuNCH, MediaMill cooperates with Maarten de Rijke on natural language processing, with Guus Schreiber on ontologies of video material, and of course with Sound and Vision, Annemieke de Jong providing the basic material.